In recent times, the silicon dioxide (silica) coating has been found variety of applications ranging from gas diffusion barrier coatings to tribological coatings. In this application, silica coating along with Cr has been developed for measuring the film thickness of lubricants optically. 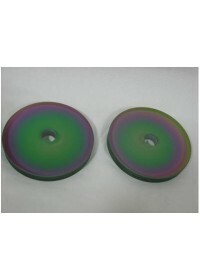 And the product is a fine polished glass disc of 10 mm thick and 100 mm dia. coated firstly with a thin layer of chromium (Cr) followed by a thicker Silica layer using Magnetron Sputtering technique. The Cr and Silica coating layers have been optimized for necessary thicknesses with good adhesion, chemical resistance, mechanical, optical and tribological properties. .This product has been completely developed and evaluated in order to meet the above application. The product is used in an EHL (Elasto Hydrodynamic Lubrication) Ultra Thin Film Measurement System which is a computer controlled instrument for measuring the film thickness and friction (traction) coefficient of lubricants in the elastohydrodynamic lubricating regime. This instrument can measure film thickness down to 1 nm with a precision of ± 1 nm.